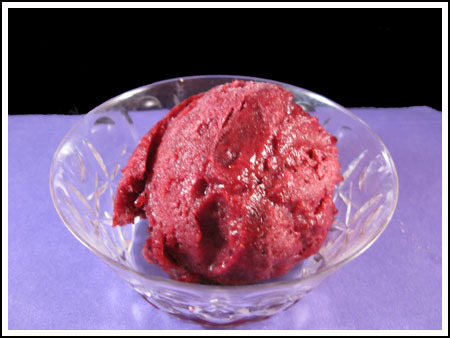 I’d never made sorbet, but after attending an event at Thai Fresh where Jam was whipping out all kinds of berry flavored ice creams, I had the urge to drag out my ice cream maker and make Blueberry Ginger Sorbet. This recipe is adapted from a collection of state fair winners, but during a quick web search, I found it in other places including the New York Times where it’s credited to Molly O’Neil’s “On Blueberry Hill”. There are some minor differences in the directions, though. The main being that the NYT version says to puree the berries with the ginger syrup and then strain. The state fair winning version says to puree the berries with the lemon THEN strain and combine with the cool ginger syrup. I liked this version best because it keeps ginger syrup from being lost in the straining process. Blueberry sorbet with a hint of fresh ginger. for 5 minutes. Let stand until cool. Puree blueberries and lemon juice (I did it in a food processor). Strain into a bowl, leaving behind the blueberry and some skin. Discard. Combine the blueberry lemon mixture with the ginger syrup and chill until very cold. Freeze in an ice cream maker following manufacturer’s instructions. Thanks for the info girls. I think all of the Cookie Madness recipes are blue ribbon winners. I’ve gotten so many terrific recipes and ideas here. I am really intrigued about Thai Fresh. If Anna’s been, then I know it’s worth seeking out. Anna, I admire your discipline. Your dedication to Cookie Madness is remarkable. State Fair recipes do not usually need to be original recipes. Check with your state, but typically the judging is more on the execution and presentation. To answer a few questions, the ginger is pretty strong. I don’t know if I’d call it overpowering, but the ginger flavor gave the blueberry flavor a run for the money! Todd liked it. I personally would eat this in a really small portion as a component of another dessert. Then again, I’m not that into sorbet. But Todd liked it as did the New York Times ;). Cindy, I saw on Twitter that Nicole did the car cookie baking which is why I didn’t do it. Beth, most state fair recipes I’ve seen are pretty recognizable. I think with a lot of these fairs and contests, it’s about execution rather than the recipe itself. But I’m not an expert on state fairs. All I know is I see a lot of state fair winners that are old Pillsbury winners or just tried and true recipes someone “picked” to compete with. Again, I’m not an expert on state fairs….that’s just an observation. Thai Fresh is a store/restaurant where you can buy pre-made Thai food or ingredients to make your own. Someone told me Bon Appetit just did a write up on it, so if you see that in a magazine you can say you saw it here first ;). This looks so refreshing. Perfect for this time of year. Do you know if State Fair recipe entries usually need to be original recipes? Is Thai Fresh a local store or a chain? The sorbet looks very refreshing! I think when your air conditioning went out someone suggested baking cookies in your car. I thought it was a joke but Nicole at Baking Bites did it in today’s post!!!!! I love sorbet and blueberries. So, was the fresh ginger not overpowering? I always cut back the measurements on fresh ginger because I’m afraid it’s too strong, but I actually don’t use it a lot. I love sorbets. I’m not sure about the blueberry/ginger combo, but it sure looks good. I used to make some from the Frog Commissary Cookbook.